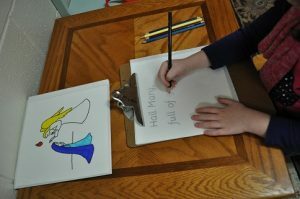 Catechesis of the Good Shepherd is a hands-on method of faith formation based on the Montessori method of learning. Catechesis of the Good Shepherd utilizes a prepared space for children called the “atrium” and extensively trained catechists. 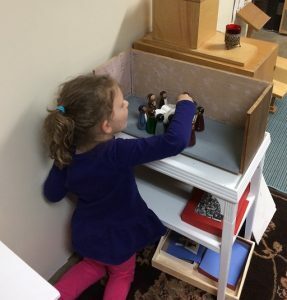 The atrium is filled with child-sized furnishings and manipulative models representing people, places, and objects found in scripture and liturgy. Everything in the atrium is made to feed the deep religious potential of children. 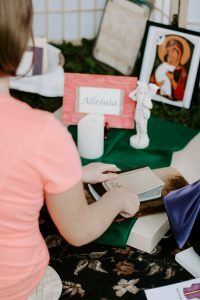 CGS acknowledges that children are already in relationship with God and the catechist seeks to serve the child as they grow in that relationship. In the atrium, the only true teacher is Christ; the catechist and the child are co-listeners to the word of God and the great mystery of our Faith. 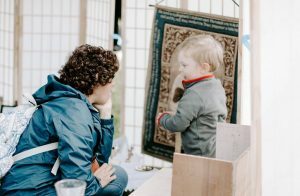 Children are introduced to a material and then given time for choosing their own material to return to for their own contemplation. The level I atrium has been compared to a monastic environment, where each person prayerfully does their own work. Each level has its own materials and presentations designed to meet the developmental needs and religious potential of children in the age range. The ages are grouped according to Maria Montessori’s planes of human development. 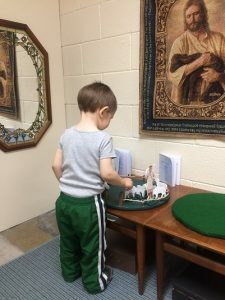 We have a level I atrium at Blessed Sacrament as a faith formation option for children in preschool, PreK, and K.
Catechesis of the Good Shepherd began in Rome in the 1950s through a collaboration between Sophia Cavelletti, a Hebrew scripture scholar, and Gianna Gobbi, a Montessori educator. They spent their lives developing materials that feed the spiritual development needs of children ages 3-12. Catechists began using Catechesis of the Good Shepherd in the United States in the 1970s. 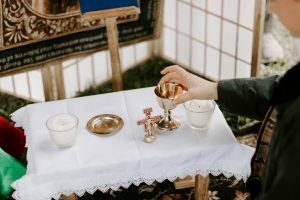 It continues to grow and today it is used in many dioceses across the United States, in 37 countries, and by several religious orders including the Dominican Sisters of St. Cecilia and the Missionaries of Charity. The atrium at Blessed Sacrament began in 2015.